Many parents I know try to treat their children the same. Christmas presents should cost the same and if one child has a hockey lesson the other should get equal opportunity in another pursuit. This seems only fair. Is this common sense cultural norm good for our kids, our work teams and our organizations? I have a few clients that use the survey question “The same rules are applied to everyone equally.” The result of a negative finding is a dialogue that ends with “Of course they are not applied to everyone equally, the situations are different.” The result is managers become more aware of how they do not treat everyone equally. Frontline employees regularly agree that rules should be applied differently. They recognize that we are all different and our collective goal is the point. 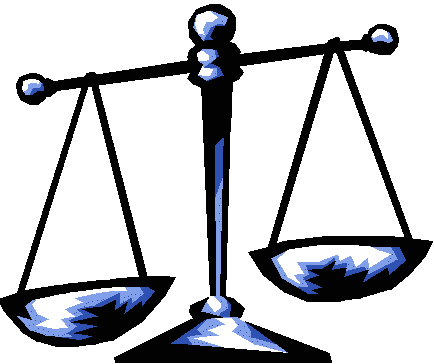 We are not trying to achieve equality unless it is a means to our end. I have coached football for eleven years at a high school in Vancouver. We coach football. That does not change. Our offense and defense have minor changes each year. Our team is trained with incremental improvements in content and style. Our boys are the same age and in the same school setting. This year, I was reminded once again that the individual players change everything. Creating a high level of performance changes every year with the players. As coaches, we need to get to know our players as individuals and as a group. 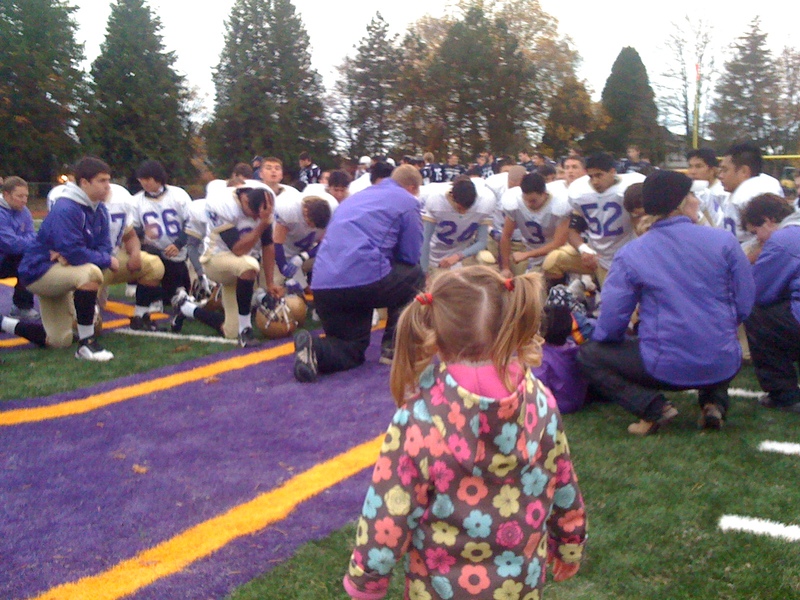 Kendra watching the post game prayer. We have the same team rules for everyone. These rules are simple and universal. They cover the obvious things (i.e. don’t be late). Some rules are never used and others have to be frequently applied. When applying rules we must ask ourselves, what is best for this person and what is best for the team? Our goal is to transfer our discipline to their intrinsic motivation. We desire every player to submit to the rules so that our team can function and perform. To get there, our players are on individual journeys and this requires a variety of interventions to progress. Our principles and rules do not change; however our ability to achieve growth collectively depends on our ability to apply the rules with wisdom and grace. The process our team takes to be self determined has multiple stages. We seek to create a community around the common goal of winning a championship. We start soon after the ending of the previous season with off-season training sessions. Before we get to training camp the next year we have two off site events, one is a tournament and one is a football camp. These activities work on football skills and build personal relationships. When fall camp starts we have a two day retreat where we facilitate a team charter. 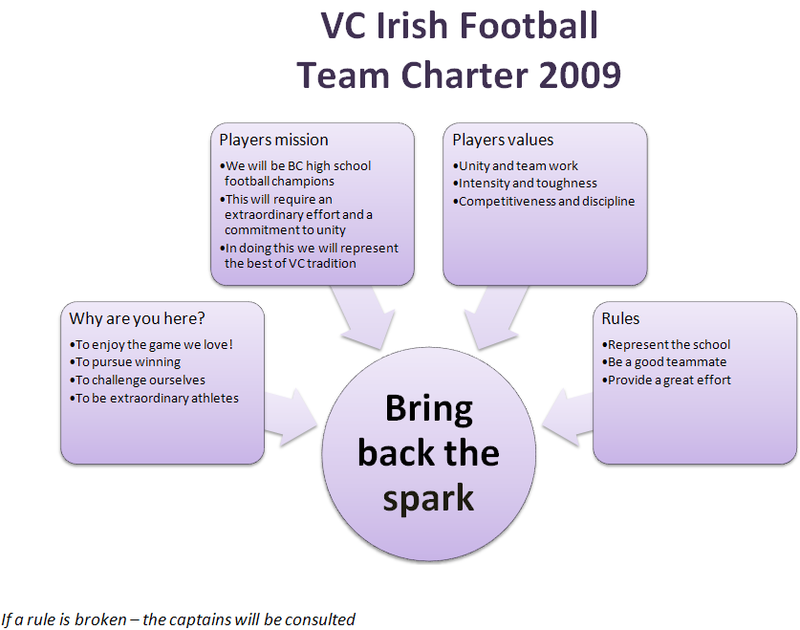 This charter is created by the players to determine who and how they want to operate for the season. At the end of this session we have a ceremony to celebrate the official formation of our team. This year we had each player sign an axe handle as a commitment to themselves and each other. At the end of the regular season, the handle was awarded to the player that most resembled the attitudes and behaviours the players decided they wanted to achieve. Rules are the norms we aim to follow. We need to work together so we can perform. The rules are not the purpose and should only act to facilitate our growth and protect our ability to operate. At work we need a process that enables employees to intrinsically apply rules. Fairness comes from our responsibility to each other and our collective goals. Applying rules need to facilitate individual and collective success. How are you preparing your people to do this? Tony Dungy in his biography talks about having to treat his players differently. It is a good read and has some memorable quotes.